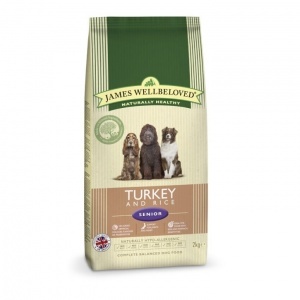 James Wellbeloved Turkey and Rice dog food - Complete balanced diet for senior dogs. The combination of rich meat goodness of turkey with wholesome brown rice and energy packed organic oats. Hypo-allergenic to help stop loose digestion and soothe skin irritation. Gentle on your dog's digestion. 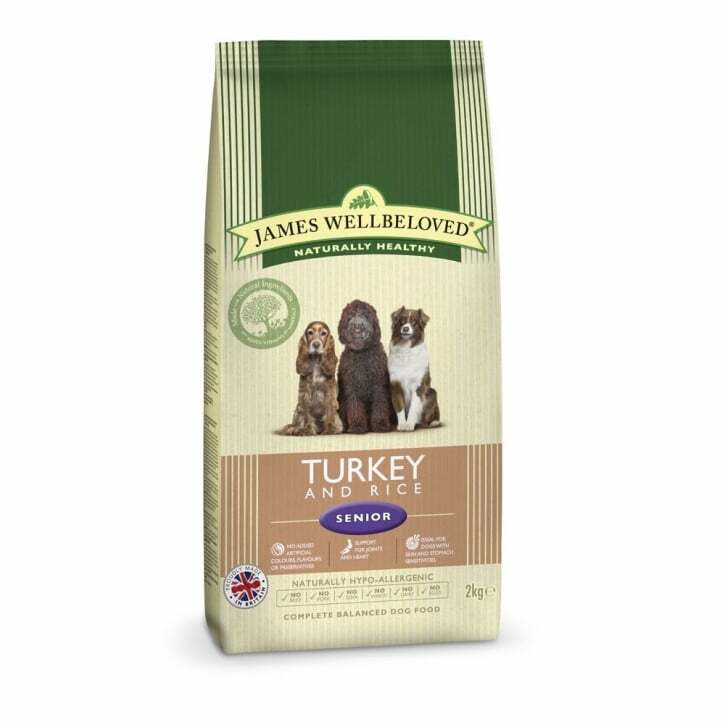 With organic oats for energy and JW+ unique formula Joint Therapy System - a special mix of chondroitin glucosamine and herbs to help lubricate dogs joints and ligaments aiding mobility. Brown rice (36.5%); turkey meal (17.5%); naked oats; white rice (13.9%); whole linseed; sugar beet pulp; turkey gravy (2.9%); turkey fat (2.1%); alfalfa meal; pea fibre; seaweed (0.5%); omega supplement*; potassium chloride; sodium chloride; parsley (0.125%);nettles (0.125%); taurine (0.1%); chicory extract (0.1%); calcium carbonate; glucosamine (0.045%);yucca extract (0.02%); chondroitin (0.005%); * from fish oils.